Demolition work has begun on an iconic department store in Norfolk that was ravaged by fire at the end of last month. It had been hoped that the former Aldiss building in Fakenham market place could be saved but there's been too much heat and water damage. It was on May 25th that fire tore through the historic row of buildings causing millions of pounds worth of damage. It was one of the biggest blazes seen in Norfolk for years. Five families living nearby were made homeless. Ninety firefighters tackled the flames. It's going to take four weeks to clear the site completely. A new community appeal's been launched in Fakenham to help raise funds for people who lost everything in a fire in the centre of the north Norfolk town. It's been a week since flames ripped through the former Aldiss building leaving several people homeless. Now a group called "Let's Fight for Fakenham" has been set up. Could your photos help Fakenham fire investigation? Firefighters tackle the blaze in Fakenham. Credit: ITV News Anglia. Officials investigating a fire which destroyed a historic town centre building in Fakenham are appealing for witnesses to send in their photos of the blaze. The Original Factory Shop caught fire on Sunday morning as shoppers began to arrive. Two people had to be rescued from flats above the store and five families have been left homeless. Staff at the Original Factory Shop in Fakenham have been praised for leaving the building so quickly once the fire alarm sounded. Marketing Director Colin Leggatt said workers got shoppers out and left immediately without going back for their possessions. Phones, car keys and bags were all burned. Mr Leggatt said the company was trying to find work for the 12 employees at its other branches in Dereham and Snettisham while it looks for other premises in Fakenham. It'll hold a staff meeting tomorrow. Staff are also being offered counselling to help them come to terms with Sunday's blaze. The company says work to find out what started the fire may take some days. 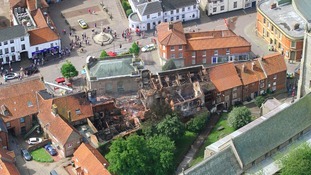 Experts are to be called in to demolish the remains of historic buildings ravaged by fire in Fakenham. The old Aldiss building on Upper Market Place is a smoking ruin after Sunday's fire. More than ninety fire fighters brought it under control. Crews were at the scene overnight. People were led to safety from flats in the row but no-one was injured. Norfolk's Fire chief said the buildings could not be saved. Norfolk's Chief Fire Officer Nigel Williams has spoken of the challenges of fighting the Fakenham fire and what lies in store in the days ahead. 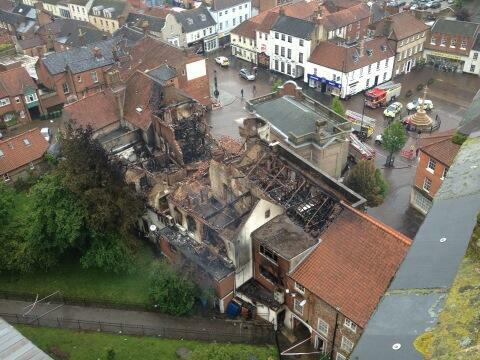 You can see pictures here of the devastation left by the blaze in Upper Market Place. One fire crew will remain at the scene on standby throughout the night.